For anyone looking to put a high-quality PSU at the heart of their next desktop PC or mid-ranged gaming rig, the Scythe Stronger 700W wouldn't be a bad choice. It's able to deliver power to a range of system components that include PCI-E and SATA based equipment. For all of our tests the Scythe Stronger 700W achieved 100 per cent of the manufacturer's claimed performance based on real-world scenarios involving the most commonly used 12 volt rails. Looking at total efficiency, the Scythe Stronger 700W achieved an average performance in its field of five competitors, placing it in front of other mid-range power supplies such as the NesteQ Xzero 700W, and behind better units like the Cooler Master Silent Pro Gold 800W. Its main weakness turned out to be standby efficiency, where it trailed most of the field and turned out to be one of the lower performers in its range. Countering this, the PSU produced less decibel noise compared to all similar power supplies in its class, with the sole exception of the Cooler Master Silent Pro Gold 800W, making it among the quietest under test. The large 140mm fan performed well to vent produced heat, helping to keep the PC cooler on the inside than at the exhaust outlet, and the cabling did not significantly heat up during high load test runs. During loading the tested rails were all within the ATX specified tolerances, easily achieving the standard. To back this quality up the Scythe Stronger 700W produced a nearly jitter free voltage reading at a 75 per cent load test, making a near flat line to indicate low electrical interference. 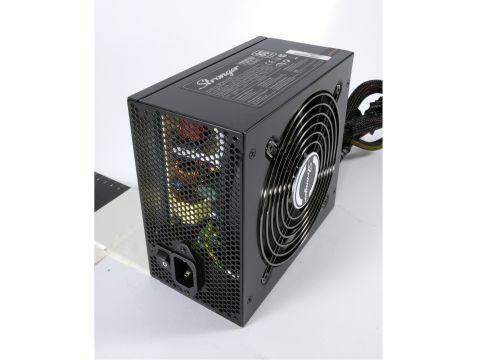 The PSU has a simple and effective design consisting of a black casing and fan housing. At the rear of the power supply is a honeycomb grate, used as an exhaust to prevent heat retention. The build quality of the Scythe Stronger 700W is generally good, with a particularly robust feel to it. It's of a standard design and has dimensions of 160 x 86 x 150mm, and this is largely why the Scythe Stronger 700W has an average weight, measuring in at the 2.024kg mark. The manufacturer's stated AC power input is 100-240V 12-6a 60-50 Hz. The Stronger comes with a reasonable total of 28 output connectors; 1x ATX 20/24-pin connector, 1x ATX 8-pin connector, 4x PCI Express 6/8-pin connectors, 10x SATA Connectors, 8x 4-pin peripheral (MOLEX) connectors, 2x floppy connectors and 2x intelligent fan connectors. For a lower-end PSU it put in a strong performance across the board, although it could further benefit by an improvement in standby efficiency.